Samuel Elder and Caroline Kienzle came together with other finalists in New York City for five days in February. Samuel Elder and Caroline Kienzle, students at Moorestown High School, were selected for the 2018 High School Honors Performance Series at Carnegie Hall. From left to right are: Caroline Kienzle, MHS student; Sergey Tkachenko, MHS choral director and a chaperone for the trip to NYC and Samuel Elder, MHS student. 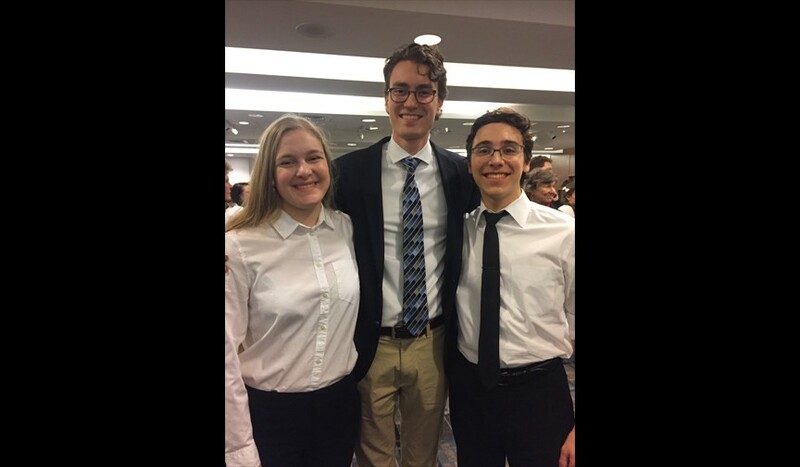 Samuel Elder and Caroline Kienzle, students at Moorestown High School, were selected for the 2018 High School Honors Performance Series at Carnegie Hall. Elder performed as a Bass 1 with the High School Honors Mixed Concert Choir, and Kienzle performed as a Soprano 1 with the High School Honors Women’s Concert Choir. Participation in one of the five honors ensembles is limited to the highest-rated high school performers from across the world. Earlier this academic year, MHS choral director, Sergey Tkachenko, nominated Elder and Kienzle to audition for the honors performance series. The Honors Selection Board accepted them after a review. Acceptance to the elite group is a direct result of the talent, dedication and achievements demonstrated in their applications and audition recordings. Elder and Kienzle joined other performers from all 50 states plus the District of Columbia, Guam, six Canadian provinces, Australia, China, Hong Kong, Mexico, New Zealand, Qatar, South Korea and the United Kingdom for a special performance at world-famous Carnegie Hall. Elder has studied music for 10 years and is a member of the Moorestown High School Madrigals and MHS Honors Choir under the direction of Tkachenko. He is also a member of MHS Honors Orchestra and First Presbyterian Chapel Choir. Elder was also accepted to the Honors Performance Choir performing in the Sydney Opera House this summer, and he previously performed with the NJ Junior High Honors Chorus and more recently with the NJ High School All State Mixed Chorus. Kienzle has studied music for seven years and is a member of the MHS Madrigals and MHS Honors Choir under the direction of Tkachenko. She recently performed with the NJ High School All State Mixed Chorus. Finalists came together in New York City for five days in February. They had the opportunity to learn from world-renowned conductors, work with other finalists and get a taste of New York City.